NEW YORK (CNNMoney) -- Google has revealed the Samsung Galaxy Nexus, the latest "Google phone" that serves as the bench-setter for Android devices. The Galaxy Nexus smartphone features some impressive hardware, including a larger-than-usual 4.65-inch screen, an ultra-thin design and a camera with virtually no shutter lag. But the most crucial new feature is Android 4.0 -- the latest update to Google's mobile operating system, code named Ice Cream Sandwich. The new version of Android delivers a host of improvements to the world's leading -- if not beloved -- smartphone operating system. "While people like and need Android, they don't love Android," said Matias Duarte, Google's director of Android user interface, at an event co-hosted by Google and Samsung in Hong Kong. "Android should be enchanting, seductive, and something you can fall in love with." Google (GOOG, Fortune 500) believes it delivers on that notion by giving Android a total makeover with Ice Cream Sandwich. The latest version of Android offers a distinctly more tablet-like experience, with interactive and resizable widgets, large thumbnail images, and a button-free interface. Ice Cream Sandwich also comes with some groundbreaking features such as facial recognition technology, which will scan your face to unlock your phone. The demo failed at Tuesday night's event, but Google maintained that the feature works. And the new Android Beam technology allows users to share just about any kind of content, application or contact by placing the phones back to back. Android 4.0 also features dozens of other useful improvements, like instant talk-to-type, displaying the words you say into the phone in real time rather than after you finish talking. Users can also pinch to zoom into calendar appointments, create folders by dropping apps or contacts on top of one another, and save webpages for offline viewing. The camera app got perhaps the biggest update. In Ice Cream Sandwich, users can take panorama photos with their cameras, and snap photos in rapid succession. The front-facing camera can also track eye movement and rotate a 3-D image based on where a user looks. If two or more people are sitting next to one another in a video chat, the camera application can track who is talking and will automatically focus in on the person who is chatting. Though many features were unique to Android, several Ice Cream Sandwich improvements seemed to take a page from the competition. For instance, gone are the four buttons at the bottom of the phone, replaced by on-screen navigation keys and an Apple (AAPL, Fortune 500) iPhone-like "action bar" at the bottom of each screen. The action bar replaces the menu button, providing users with commonly used features and the ability to change an app's settings. Like Microsoft's (MSFT, Fortune 500) Windows Phone, Ice Cream Sandwich offers in-line spell check; large, interactive "people" tiles; and a stream of friends' social network updates in a new "people" app. And like the Research In Motion's (RIMM) BlackBerry Playbook and Hewlett-Packard's (HPQ, Fortune 500) now-defunct webOS, Android 4.0 introduces a consistent "flick-based" gestural user interface -- when a user is done with something, they can just flick it away. With Google's new mobile OS, the same software will be simultaneously available for smartphones and tablets for the first time. Currently, smartphones and tablets run two different operating systems -- Gingerbread and Honeycomb. 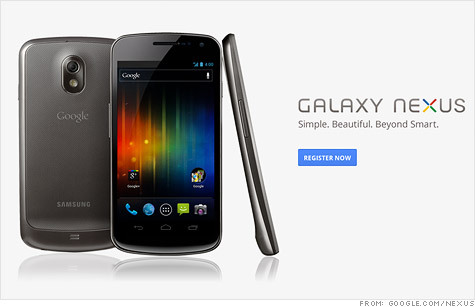 The Galaxy Nexus, which will launch in November, is the third flagship Android smartphone. Google receives bids and proposals from various handset manufacturers to make the device, which comes out annually during the winter holiday season. Samsung has made the Nexus device for the second straight year. The first Google phone, the Nexus One, was made by HTC. Subsequent flagship devices will be closely scrutinized, if Google's $12.5 billion bid for Motorola Mobility (MMI) goes through. Google said Motorola would not automatically win the rights to make the next Nexus phone, and it would have to bid alongside other handset manufacturers to build next year's flagship device. No specific date or carriers were announced for the Galaxy Nexus.